Young people from the Red Cross of the Republic of Macedonia are young people from the territory of the Republic of Macedonia, who are committed to improve the lives of the vulnerable population, by using the free time for volunteering in the activities and programs of the national society. They are under the age of 30, of different nationality and religious affiliation and are organized at the national and local level. Within each branch organization of the Red Cross and Red Cross of the City of Skopje, the youth are organized in Youth Clubs, while at the national level representatives from all youth clubs are composed of the Youth Council as the highest body of the Youth of the Red Cross of the Republic of Macedonia . On the territory of the Republic of Macedonia, 34 clubs of young people are active, in which activities as of 31.12.2017 in 30 clubs of young registered 1894 young volunteers. All 34 clubs of youth function in accordance with the Rulebook for organization and work of the Youth of the Red Cross of RM and the Statutes in the Branch Organizations and the Red Cross of the City of Skopje. In addition, each club of youth has its own organizing guide which describes the manner of organization that differs depending on the needs of the club. 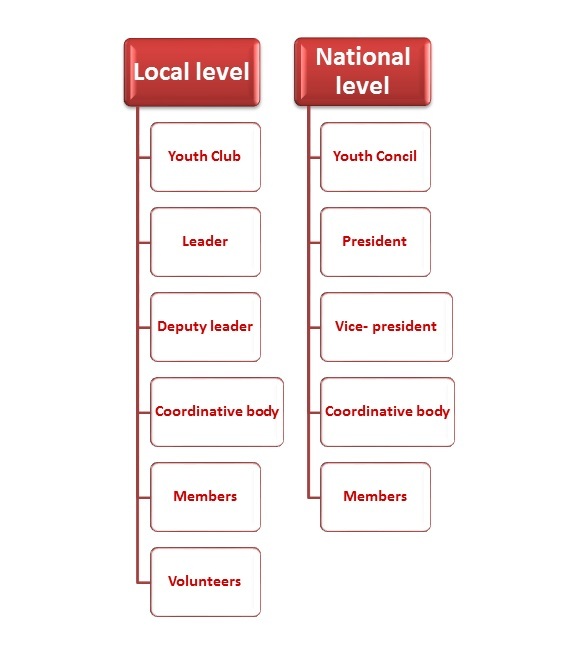 In some youth clubs, there is a branching of smaller organizational forms due to extensive territorial coverage in schools or local communities (school clubs for education and prevention), and there are also branches of clubs organized for action in certain programs (Club 25 or Youth Club blood donors).